Gifts have been avital part of us seen the origin of mankind. No event is complete without gifts are exchanged from one another. Let it be Diwali, Pongal and Onam, Durga Pooja, Janmasthami, Easter, Baisakhi, Vishu, Id, Dhanteras, Maha Shivarathri, Bhaidooj and many other cultural traditional festivals and also during personal occasions like anniversaries, birthdays, retirements, Passovers, house warming and many such occasions. We usually give gifts that suit the occasion and it is very fun to always gift people something that they like. For example we know when the festivals hits our we gift one another sweets, we sometime also gift them idols of Gods, diyas (lamps) or any such things that can be used during this time. Similarly during occasion like house warming us give gifts that can be used as decorative purpose. It can be lamps, or any artifact made of brass, gold or silver, portraits, paintings or any such things that can be used as decorative item. We also gift money on occasions like baby shower, weddings, engagements or such occasions. People also gift gold as it is considered as auspicious. Whatever the occasion is the idea of buying a gift always excites us. Imagine the greatest festivals of the year Christmas, the whole process of the sending and receiving gifts is so exciting. The cheery on the cake is the ‘Secret Santa’ game that is again very exciting. The whole process of buying a gift and giving to the person concerned without them knowing about is so thrilling and similarly we also know that someone has gifts ready for us too. Then we secretly look back to know their reaction. This is exciting in a whole new way as we also have to ask other people secretly about their likes and dislikes so that we can gift them something of their choice. This whole idea of sending and receiving gifts for any occasion always brings happiness and ecstasy. Personalized are the rising trends currently. The personalized gifts are the direct way to heart. We had a trend of gifting albums that includes all your pictures. Today we have key chains, coffee mugs, t-shirts, sweatshirts, bed cover and what not. Such gifts are mostly given during weddings, anniversaries, Valentine’s Day or any such occasions. Such gifts conveys the message about that the receiver is very special and important to us. The other gifts that have gaining trend today are mobile accessories like headphones, phone case or any such gift items. Gift vouchers are another way of gifting present today. This actually saves time and also the receiver can buy any item that he wants. Let us say that we are gifting someone a gift voucher brought from Amazon, Myntra or any other website it can be very useful as the receiver can buy the things of his choice. Flowers are the calmest, beautiful and safest gifts we can give anyone. Let it be affection or friendship flowers always indicate affection and warmth. Similarly for those who are unable to express their feeling clearly, try gifting a greeting card and write down all your thoughts in it. A hand written message is always a key to heart. Gifting perfumes is also a common tradition among people; it can actually confuse people about their emotions and feeling. However a person who likes perfumes, gifting perfumes to them is a good idea. Cooking food is the best gift you can give someone and it conveys the message loud and clear that ‘I love you’. These are just few ideas of gifts but whatever gift you want to give always keep in mind that the thought or the message that you wanted to convey through this gift is what is more important than the money you have spent. All of us are lazy and we always look for easy ways to finish our jobs. Similar is the case with gifts too. Buying or sending gifts online is what we choose as it is very time consuming and easy. We couldn’t agree anymore when we have all the gift items right in front of us none of us is taking the harder job. This is also exactly why you are here, as it is clearly visible our portal is exclusively meant for gifts .Our portal has gifts for every occasions. Let it be Diwali, Christmas, Onam, Pongal, Dussehra, Durga Pooja and what not we have gifts for all of them. You can find chocolate cake for chocolate lovers, fruit cake for chocolate heaters , earthquake cake, dirt cake, red devil’s cake, marble cake; that’s it, the name itself is so mysterious leaving all of us to dream about how does they look most importantly how do they taste. Now that is the option of cakes similarly we have a very huge gallery of other gift items like jewelry, clothing, perfumes, personalized gifts, metal artifacts and the list goes on. Spread happiness and let people know that you are thankful and that they are acknowledged for everything that they have done for you. So send your parents gifts on their birthdays, let your boss know that despite of him/her being rude you love them for always mentoring and correcting them. Hold on, there is more to it all our deliveries are free with zero shipment charges and the main point to be noted we are easy on pockets. What are you waiting for send your gifts online to anywhere in Gaya. Also we want you to know that our shipment charges to countries like Australia, Canada, France, UK, UAE, USA and Singapore are free. Sending gifts across India and abroad is easy like never before. We also extended services to nearby cities including Bodh Gaya, Tekari, Sherghati, Rafigani, Hisua, Islampur, Jahanabad, Rajgir, Silao, Nawada, Masaurhi, Chatra, Kodarama, Hilsa and Daudnagar. 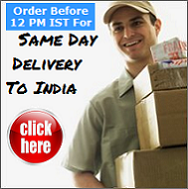 Now send gifts/presents to Gaya (India) and get free online delivery. Buy/order presents like flowers, cakes and sweets and get them delivered at cheap and discounted rates to Gaya.